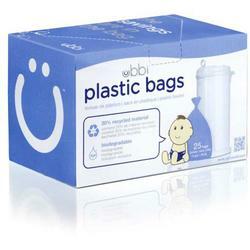 Ubbi plastic diaper pail bags come in handy for easy disposal of soiled diapers. Theyre made of recycled materials and are biodegradable, making it an eco-friendly choice. This pack has 25 plastic bags. Each bag has a 13 gal. capacity.